Finely chop garlic, lime peel and salt together. Rub onto surface of swordfish steaks. Heat oven to 450°F. Cut four 15x12-inch pieces of foil. Place 1 swordfish steak in center of each piece of foil. Wrap packet securely using double-fold seals. Place packets on cookie sheet. Refrigerate 30 minutes. Bake at 450°F. for 10 to 12 minutes or until fish flakes easily with fork. Meanwhile, in medium bowl, combine all salsa ingredients and 2 tablespoons of the reserved pineapple juice; mix well. Serve salsa with fish. Another meaty, firm-fleshed fish, such as halibut, can be used in place of the swordfish. The swordfish can be baked in parchment paper instead of foil. For each piece of fish, fold a piece of parchment paper in half and trim into a half-heart shape large enough to hold a piece of fish. Open heart, place fish on one side of heart. To seal food inside, fold edges in overlapping pleats and twist end shut. En papillote is the French expression for this cooking method. 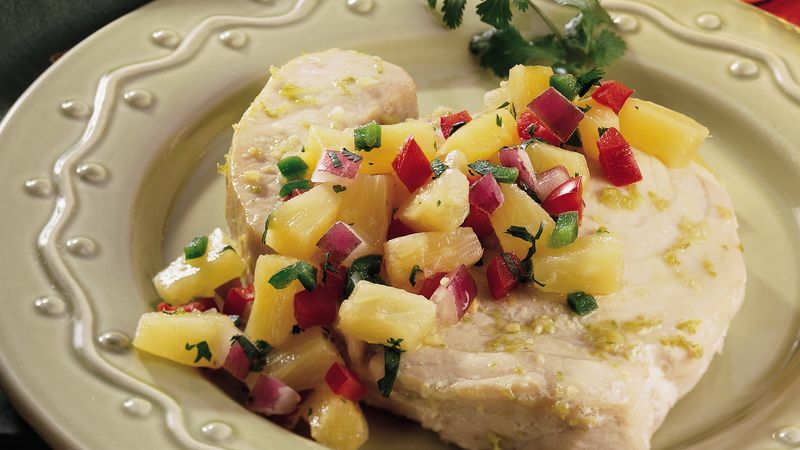 The pineapple salsa also goes nicely with grilled chicken or pork.